I had colour coded my pattern because I wanted to play with the lights and darks of this block and was thrilled with how things were working out. Then I went to sew the squares together and discovered a tiny design fault – one of the seams does not line up exactly… insert appropriate swear words. Frustrated I decided to sew the whole star together anyway just to check out the design… this is how it looks. I was planning on attaching the pattern for this block, but I now have to go and amend it. 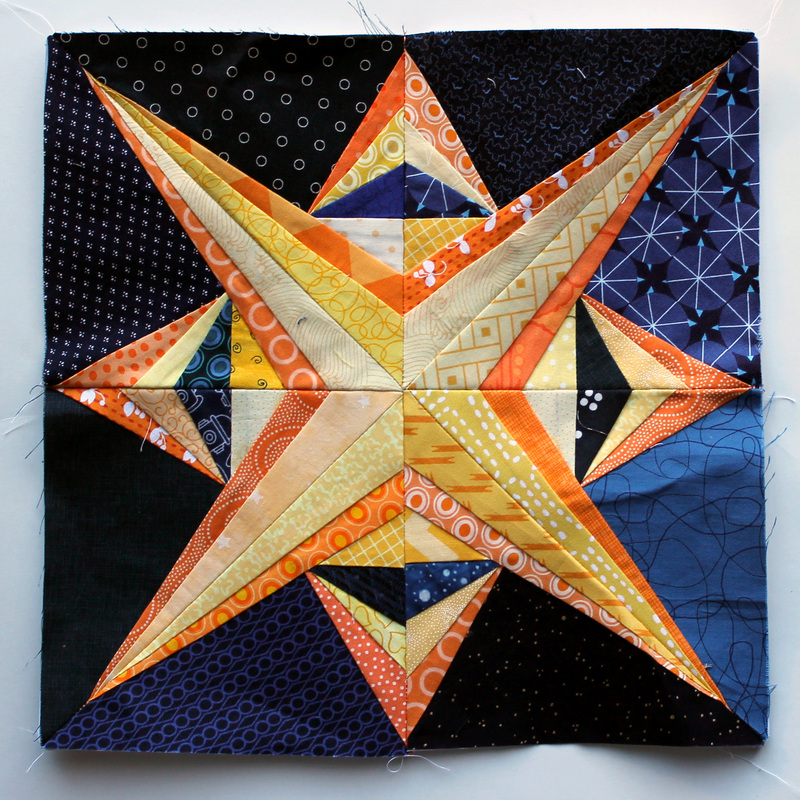 I will make sure a correct and proper pattern is attached to this Star in my “Free Paper Piecing Patterns” section as soon as possible. I am now debating whether to unpick it, start again or just call it good and move on. Well it is certainly not too bad for a first go at it. I would keep the sewn star, adjust the pattern a tad, and declare a victory! Lynne I agree. I am inclined to just call it good and move on…after fixing the pattern though! Call it good, a learning block which IMHO was good for a first time pattern. I would keep it and use it in the backing. call it good and GO! Yeah, it’s not perfect, but it is pretty and will work for something. Better to start fresh and enjoy your time spent! Strewth… (note Aussie accent) it’s fine! It’s work in progress. It’s aaaaaaall good. Only the evil-minded will closely examine your beautiful stars quilt looking for slightly off seams. You note that I don’t call them mistakes. They are learning opportunities. Fix the block. Remember what you did wrong next time you design one. And by the way, it’s beautiful. I vote for ‘call it good and move on’ also, but fixing the pattern for future uses. I love the long skinny points! I think since it is a yellow-yellow point that doesn’t match up, it is forgivable and not worth the unpicking! Beautiful block! It is glorious as is! 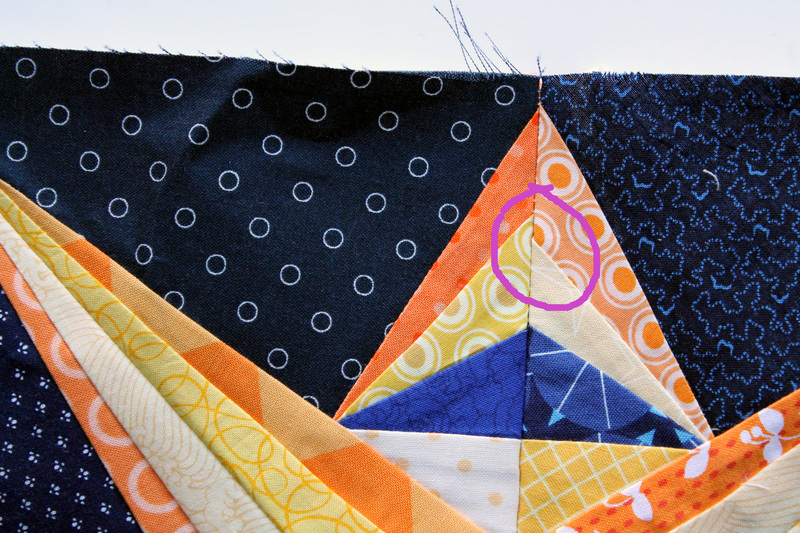 I’m sure if I made this block, there’d be more that one seam that didn’t line up! That said, if it’s going to stare out at you and taunt you from the finished project, reach for the seam ripper! I still like it, and it should be easy enough to fix. It’s a gorgeous block too. I definitely understand your frustration though. I would fix the pattern as you already plan to do and call your completed block good and done. We are always much too harsh when we judge our own work. Love it either way. On its own it is ok to leave it, but it might show up as odd unless you make other deliberate changes on other blocks to compensate. It’s fine, really. Keep it for the memory! Very nice. Can’t expect perfection on the first try. Persevere. It’s beautiful! Call it good and move on. I wouldn’t have noticed if you hadn’t pointed it out. Which software do you use? Santa Clause bought me EQ7 for Christmas. I have only just started playing and I am sure there are tons of features I have not found yet. If you hadn’t pointed it out, I doubt I would have noticed. I am sure it passes the four-foot rule and is good to go! I really like the shape of this star. Very dramatic. I would never have noticed it as a mistake, unless you had pointed it out. The issue is not whether I think it’s fine, but whether you’ll be happy with it. If you will stare at it and see it as wrong then unpick it. But for what it’s worth, I think it’s gorgeous. Thanks Erin. I get bored easily so I am happy to move on. And I have learnt from my mistake that’s for sure. Não desita dele tenho certza que vai conseguir imprimir na sua arte o melhor de ti,tudo lindo! You know what they say … finished is better than perfect. 😀 Call it good and move on. It is a lovely block. All your paper piecing is fabulous and perfect! I find this beautiful mistake refreshing and real. I’m on the call it good side. Did you do the stand across the room and see if it’s still noticeable thing? If it isn’t, then put it in your quilt. I would definitely not unpick. I don’t even know how you would do that. 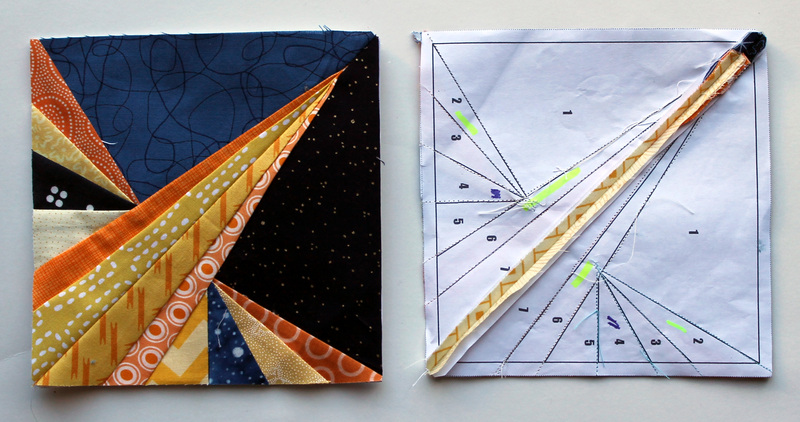 I made a mistake in the middle of a paper pieced block and tried to unpick. I stopped. I have no idea how to make that save! I just made a new block and threw the one I tried to unpick in the scrap basket. I can still cut it up and resew it into a random collage-type block some day. I love the idea that if you really can’t see the mistake at a distance it does not count. I can get on board with that. I love the colors you used, it really makes the block pop! And when I read your blog I do imagine your voice in my head. It makes the whole experience very fun!